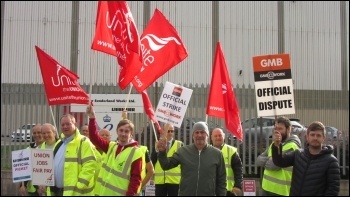 Socialist Party :: TGIFriday workers at Stratford, London. TGI staff at a number of restaurants have been on strike against cuts in their tips. "We'll be out as long as it takes", was the strident attitude of Liebherr strikers. The Unite the Union members on the picket line told the Socialist Party that they are striking for a decent pay increase. Liebbherr's offer of 3% was rejected by a decisive 94%. Liebherr is a global company, and the site in Sunderland is profitable. They assemble high quality cranes for the oil and maritime industries. Globally, turnover was almost 10 billion Euros for 2017. Yet, management, "aren't forthcoming" when it comes to offering a decent pay increase. For a number of years the company has made promises to pay more when the company does better. As their leaflet says: "The members expect the management to make good on its previous 'jam tomorrow' promises." The mood on the picket line is upbeat. The only ones going into the plant are temps and apprentices. While I was there a lorry making a delivery was turned away, and many others have also refused to cross the picket line. This version of this article was first posted on the Socialist Party website on 17 August 2018 and may vary slightly from the version subsequently printed in The Socialist.